I’m sunglass obsessed. It all started when I started flying model airplanes and wanted a pair of sunglasses that would shield my eyes from the glare of the sun (or worse, a light overcast), while still letting me clearly see my model. Getting my full-scale private pilot license only made things worse. I just had to have the very best sunglasses that one could get. Zurich R/C sunglasses with a uniform grey tint. I’ve modified these by shortening the temples and attaching a cord. My first try was the Zurich R/C sunglasses that I had bought for flying models. These were actually pretty good. They are distortion free, quite dark, and cover the sides too, giving good peripheral vision. As a bonus, they’ll fit over most prescription glasses (which I don’t have … yet). What I don’t like about the Zurichs is that they are completely non-adjustable. I have a wide face (7 5/8 hat size), yet my ears seem to be closer to the front of my face than average. As a result, the temples of the Zurichs are too long, and the glasses were forever sliding down my nose. To add injury to insult, the useless temple tips were also angled too far inward, and with a headset on, they caused sore spots behind my ears. The nose pieces are also non-adjustable, making the glasses happiest on the lower, wider part of my nose, which is not where I wanted them. Twenty years ago, I bought a cheap pair of sunglasses at the neighbourhood drugstore for about $5. They were remarkably good glasses and I still have them to this day, using them on the farm on days when the extra dark safety glasses aren’t called for. They’ve gotten a bit scratched over the years so they’re not much fun for flying, or even driving. 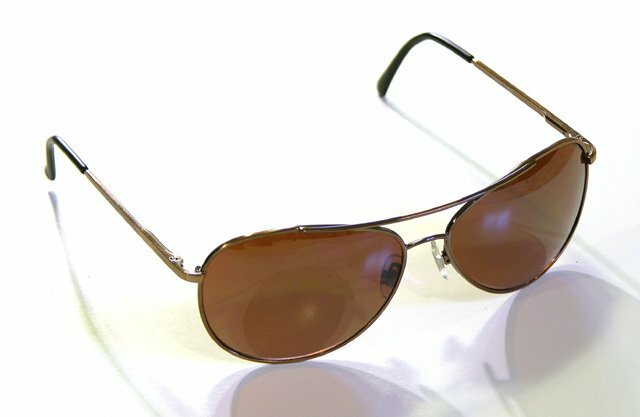 These aviator style glasses had a copper tint with a gradual gradient and slightly mirrored lenses. I was wishing I had a fresh pair of these so I started scouring the sunglass stands to see if anyone made anything like it, or if it was just luck that someone accidentally made a really good pair of cheap sunglasses. My favourite sunglass vendor came to the rescue. Lené Sunglasses has had a booth at the St. Jacobs Farmers’ Market for as long as I can remember, and I’ve been buying inexpensive polarized driving glasses there every few years. I told the owner about my quest, and after getting over the surprise that I still had a pair of $5 glasses from twenty years ago, handed me a pair that fit the bill almost exactly. Same style (although slightly smaller), same tint (although slightly darker), and a very subtle gradient near the bottom. The lenses weren’t mirrored but had an anti-reflection coating on the back (like Serengetis do). They also had more of a face-hugging wrap, somewhat making up for their smaller size. At $15, I bought them on the spot. A pair of inexpensive sunglasses that has turned out to be remarkably good for flying. 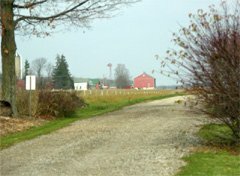 I wanted the new pair mainly for use around the farm, but I drove and flew with them the day I bought them. I was surprised at how well they worked. I could pick out traffic more easily than usual, and the light weight made them more comfortable than my beloved Randolphs. But, they are significantly darker and I find I have to take them off earlier in the evening. The moral of the story? There are some great deals out there but you have to be lucky to find them. There are lots of really expensive (and usually high quality) products out there marketed to pilots, but they’re not always the best choice. When buying sunglasses, try as many as you can, even if just in the store (buying at an outdoor market is great for testing the glasses right there on the spot). I finally remedied all these problems by cutting off the temples just before the bend, drilling holes in them, and then using a cord to tie them on, with one of those I-don’t-know-how-to-tie-my-shoes sliders on the back behind my head. A pair of dark safety glasses that have been relegated to outdoor work on the farm because they’re usually too dark for flying. 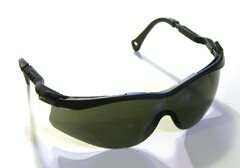 I briefly tried a pair of wrap-around dark-tint safety glasses that I found at a pilot shop near Toronto for about $20. These had a tiny bit of distortion, but not so much as to be annoying. They also provided excellent peripheral vision due to their wrap-around design. The temples were adjustable, and thin and flat enough to fit under a headset. There was really very little wrong with these except that they were a bit too dark at times (when it was still too bright to not wear sunglasses). 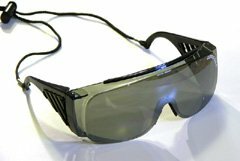 I gave up on these for flying, but now wear them as safety glasses when working outside on the farm on bright days. 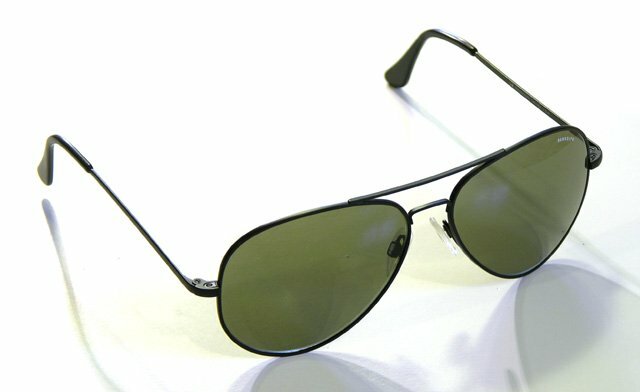 I saw (and still see) Serengeti sunglasses advertised on a lot of pilot shop web sites, so I decided these must be something worth looking into. I purchased the Serengeti Velocity style at my local Sunglass Hut, pleased to see that they came with a 30-day satisfaction guarantee. These were really nice sunglasses. Absolutely no distortion, glass lenses, lightweight frames, a nice tint, and photochromic to boot. They got their test flight on my first solo cross-country. They were perfect in every respect but one: they didn’t darken like they’re supposed to. Although they were darker than not wearing sunglassses, they were nowhere near as dark as “normal” sunglasses. The only time they darkened was when I got out of the plane to walk to the FBO to get my log book endorsed. When I got back home, I did some research and found out that the darkening occurs in response to ultraviolet light. Since the amount of UV is proportional to the amount of visible light, this shouldn’t be a problem except for one little detail: most airplane canopies or windshields are opaque to ultraviolet light. As far as the Serengetis were concerned, the cockpit of my rented Cessna 152 was a darkened room (I wonder if Serengeti and the companies that sell them know this). The next day I returned them with no hassles. Too bad, because they were really nice glasses. Although I haven’t tried them, Serengeti’s 555nm lenses might be a better choice. They are more neutral in colour and start out quite a bit darker than their “driver” lenses (15% transmittance instead of 24%), making them about right for flying as-is and getting darker when you step outside. 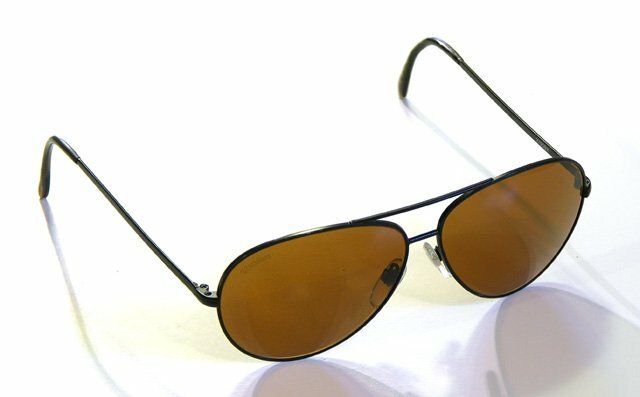 These RoadMax aviator style glasses have high quality copper tinted ground glass lenses. They’re great for flying on bright winter days. These were my first glass sunglasses other than the Sergentis I owned briefly. They have a copper tint, and I bought them to use for both flying and driving. Although they were inexpensive ($35), they have optical quality ground glass lenses and reasonably well-made metal frames. I flew with these for a while, and still do sometimes on really bright winter days, but for most flights, I find them a bit too dark, making the instruments difficult to see (especially my GPS). I wear them a lot while driving, although they do get uncomfortable after a few hours due to their weight (large glass aviator style lenses) and hard plastic nose pads. Sadly, these glasses are no longer made. This is unfortunate since they were amazingly good for their low price. Randolph Engineering makes sunglasses for the US Air Force. This is the 15% grey tinted Concorde style with black frames. These are currently my aviator sunglasses of choice. My next try was Randolph Engineering. The Randolph Aviator glasses have grey glass lenses that let through 15% of the light, which is supposed to be about optimal. Randolph makes glasses for the US and other air forces, so I figured they’d be worth a try. Their Aviator style, with straight temples and small-ish square-ish lenses didn’t appeal to me, so I ordered their Concorde style instead (more of a traditional aviator style). Putting form before function, I chose the gold frames. Nothing says “pilot” more than gold-rimmed aviator sunglasses (except maybe a watch with more dials than the panel of the plane you’re flying). I mostly loved these glasses. They were exactly the right darkness, distortion free, didn’t change the colours of things (which the Serengetis did a little bit), and stayed where I put them (after some adjustment of the frames). My only complaint was the gold frame; I found it distracting. After about 9 months, they slipped out of my pocket and a couple of very tiny scratches appeared in the left lens. My almost perfect sunglasses were now less perfect. I decided to write to Randolph to ask what it would cost to replace the lens, and maybe change to black frames at the same time. Even though I made it clear that the scratches were my own fault, the nice lady at Randolph USA told me to send them in, and they’d send me a new pair. I did, and they did! I’ve been wearing my perfect black-framed Randolph Concorde glasses ever since. Coloreyes Argento aviator sunglasses with copper-rose lenses. A couple of years ago, I read about a new kind of sunglasses called Coloreyes. Reading the materials on their web site, I was very intrigued, and also a bit skeptical. Their scientific data is a bit confusing, as it seems to imply that the glasses amplify light while at the same time attenuating it. They also claim that the lenses enhance colour at opposite ends of the spectrum, leaving the middle somewhat untouched, increasing colour contrast. Then, at the Canadian Aviation Expo in 2005 (and again in 2006), I got to try a pair on. I found that they did increase colour contrast, but I found the effect a bit disconcerting. Recently I’ve had the opportunity to try a pair with the smoke grey tint, and found that I quickly got used to them. They are a bit darker than my Randolphs, but I found that the increased colour contrast made up for this, preserving visual accuity, although I do have to take them off earlier in the evening than the Randolphs. They also have more of a curve to them, meaning that less light can get in from the sides to cause reflections. The effect these glasses have on colours is very different from other glasses; they make reds and blues look more saturated, while leaving colours in the middle of the spectrum (like green) more or less untouched. These glasses are also extremely light in weight, and the super thin temples work well with a headset. And they stay where I put them, probably due to a combination of the light weight and the head hugging temples. My only complaint is that unlike most of the other glasses reviewed here, the Coloreyes don’t fold flat, so they come with a fairly large case. Avoid polarized sunglasses. Unlike good non-polarized glasses, which greatly reduce glare, polarized glasses eliminate it. This includes those sparkles of light reflecting off nearby airplanes. 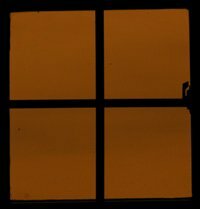 Polarized glasses can also make some electronic instrumentation impossible to read, and some windshields either opaque or kaleidoscopic, depending on how you look at them. Finally, the view through polarized glasses changes as your head tilts relative to the horizon, which could induce vertigo during steeply banked turns. Glasses with a strong gradient can be dangerous in marginal VFR (or IFR) conditions, painting a false horizon on your field of view. It’s bad enough being in conditions where you can’t discern the horizon. It’s even worse if you’re fooled into thinking that you can. Photochromic sunglasses won’t darken in most aircraft unless you’re in an open cockpit. Don’t wear glass sunglasses in an open cockpit. They provide little to no physical eye protection. Even in an enclosed cockpit, impact resistant sunglasses could save the day in the event of a large bird strike. Grey lenses don’t distort colours. Copper lenses distort colours somewhat, and so-called blue-blocker lenses distort colour a lot. Too much colour distortion can interfere with things like reading approach slope lights, or light gun signals from the tower. There is some disagreement about the right amount of light transmittance. Conventional wisdom is that for a grey lens, it should be about 15%. This is also the level mandated by the U.S. military. However, some studies have shown that people are most comfortable with 5% to 10% transmittance, and others have shown that visual acuity suffers below 25% transmittance. There seems to be a trade-off between comfort and visual acuity. I find that my 15% Randolph lenses are sufficienty dark even on bright winter days, yet sufficiently light for overcast summer evenings. The images below compare the shade and tint of the sunglasses discussed above (except the Serengetis, which I no longer have). All the photos were taken with the same aperture, exposure time, and white balance setting, so the results are representative of the effects of the sunglasses, assuming your monitor is properly calibrated. Randolph Concorde with grey lenses. Zurich with mirrored grey lens. Coloreyes Argento with grey lenses. Generic grey lens safety glasses. Bargain glasses with copper lenses. 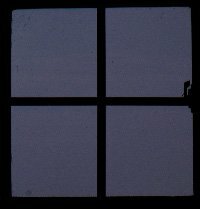 These photos of a scene were taken through each pair of glasses, using the same white balance setting, but letting the camera choose aperture and exposure time. 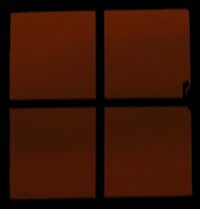 Thus, these images show only the effect on colour, not the effect on brightness, somewhat simulating our eyes’ adaptation to changing light levels. In short, these images are fairly representative of what you’d actually see. Rash, Clarence E. and Manning, Sharon D. “For Pilots, Sunglasses Are Essential in Vision Protection”, Human Factors & Aviation Medicine Vol. 49 No. 4 (Jul-Aug 2002), Flight Safety Foundation, www.flightsafety.org. Dully, Frank E. Jr., M.D. “Pilot’s Sunglasses: Mystique or Mandate?”, Human Factors & Aviation Medicine Vol. 37 No. 4 (Jul-Aug 1990), Flight Safety Foundation, www.flightsafety.org. The Flight Safety Foundation articles require you to register, but registration is free. Their web site is an excellent resource for the safety conscious aviator (which we all should be). Very interesting article. Most of this all sounds very familiar. After trying Ray-Ban aviators (too heavy, hurt behind my ears, slid off my nose, let light in around the rims) I now use Oakley Black Iridium glasses (for both full-size and model flying, plus driving) and find them excellent! I’d recomend them. Thank you for the review, noted & filed away in my head. I’m not an aviator; a telecomms technician who has to go all over creation and I’m always looking for another pair of perfect glasses. Thanks again! Several years ago I found I needed about 150 power for driving. I happened on a pair of Aviator Sunglasses with 150 power. They were a light lemon yellow tint. Not brown. Not byfocals. I found they were excelent for day and even better for night as I could see things I could not see with any others. They worked great in fog also. I wore them until they were so scratched I had to put them aside. I have not been able to find them again. Great article, Stefan! I’ve always been a sunglass maniac and wore a variety of brands and models, from RayBan Terrachrome to American Optical gray (Top Gun style). Unfortunately, now I wear prescription glasses. My current choice is Varilux Transitions on a titanium frame by Calvin Klein. These lenses are similar to the photochromic lenses you described. Of course I keep my old sunglasses, including a pair of WWII American Optical Flying Glasses (copper tinted) I inherited from my Dad. Great article!! I have a pair of RE concordes as well, gold frame, grey flash mirror lenses. I have owned them a little over a month now and I gotta say there the best sunglasses ive ever had! I like the fact that when you walk into a building you can still see with them on! the only complaint I have is that the gold frames seem to scratch up quite easily. I`m not a pilot, nor RC modeler but I find this article very good and informative. I like the comparison pictures. Thank you and greetings from Serbia. Hi Peter. It could be the levels of UV, or it could just be a different photochromic process. The ones I tried were non-prescription (now, years later, I need to wear Rx glasses for flying too). Glad to hear from a fellow aviator and hobbyist, and thanks for the donation!